In 2006, existing oil and gas exploration permits issued three years earlier were converted into underground reservoir permits using a legal technicality under the old regulations of the Mining Act. Squatex was thereby able to considerably reduce its statutory obligations towards the government. Furthermore, that same year, six other permits were acquired in the Témiscouata region close to Saint-Honoré. The number of permits went from 18 to 24 in the Lower St. Lawrence and Gaspé regions covering a total area of 447,068 Ha (see Table 1 and Figure 1). 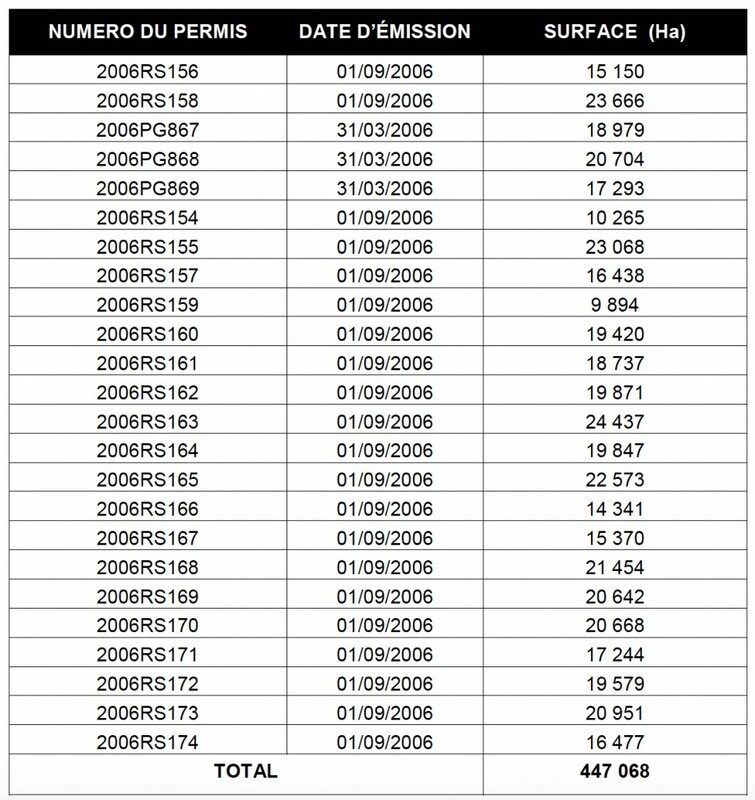 Figure 1 : Area under permits in the Lower St. Lawrence-Gaspé since 2006. Figure 2: Area under permits since 2006 in the St. Lawrence Lowlands. having an oil and gas potential became covered by permits. The value of these permits and the interest for them significantly increased especially after Forest Oil, then Talisman, became involved in the development of shale gas in the Utica Formation. Figure 3 : Squatex’s properties in effect since 2006 in the Lower St. Lawrence- Gaspé area and in the St. Lawrence Lowlands area. In October 2006, Mir Télédétection made a preliminary evaluation of the oil and gas potential of the St. Lawrence Lowlands. It started with a systematic review of the stratigraphy of the wells. This was followed by integrating satellite imagery data, topographical data and geo-scientific knowledge to better understand the structural geology and to assess the oil and gas potential of the land covered by the Squatex permits. This potential varies according to the location of the permits. Those located in the East block show a potential related to the overlapping structures (conventional reservoirs that may be located at a depth of more than five km and fractured zones closer to the surface). 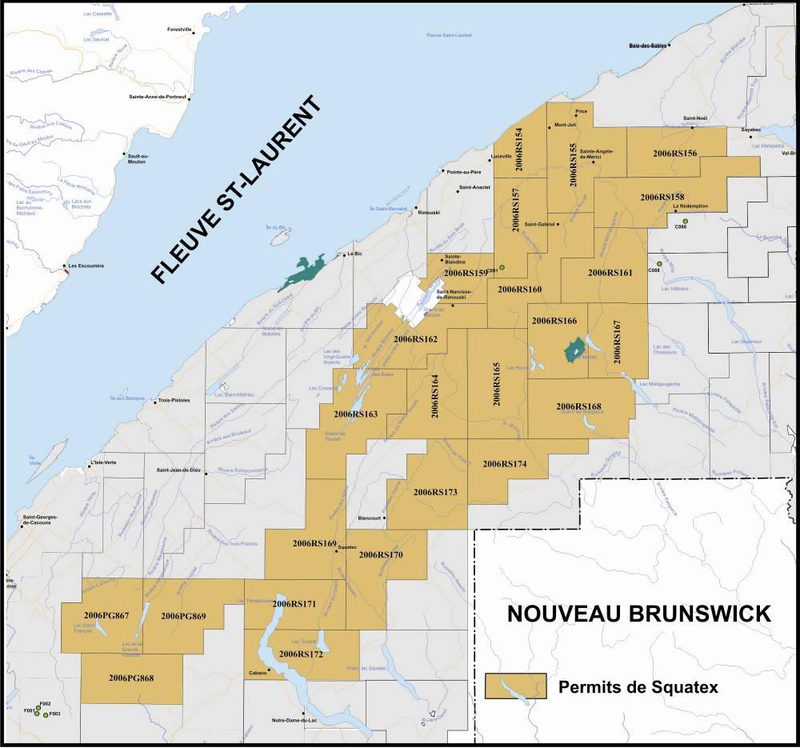 This zone is interesting because it contains the Saint-Flavien gas field that was converted into an underground reservoir in 1997. Furthermore, there are reservoirs in zones related to the platform, as was the case in the St. Simon well. Again according to MIR Télédétection, the West block permits were of interest because of the presence of hydrothermal dolomite or fractured shale types reservoirs. The report did not mention the shale gas potential that was only considered by other players the following year and especially in 2008. Currently, we believe that this type of prospect is by far the most promising. The MIR report suggested an exploration program at an estimated cost of $7M over a four-year period consisting mainly of geological and geophysical studies that would be followed by a 2,500 metre well. As we will see later, the involvement of other players from the petroleum industry would considerably change these plans. At the beginning of March 2008, MIR Télédétection was hired to perform a geological evaluation of the Témiscouata region in order to improve understanding of the stratigraphic and structural framework of this area. The study was based on spatial images, topographic, geophysical and geochemical data (see box in Figure 4). There is a geological continuity between this region and the one more to the east and it was important to understand the various geological elements affecting the region. The objective of the study was to determine whether there existed reservoirs similar to those found in the Sayabec region. Using an approach similar to the one used for the region more to the east (Matapedia) seemed the best way of gaining knowledge on the possibilities of finding oil or gas. Figure 4 :Study area in the Témiscouata region in March 2008 by MIR Télédétection. Figure 5 shows the integration of all the information on a provisional geological map in shaded relief. First, it shows two important structural corridors in a west-north-west direction, as observed in the extension of the Saguenay graben located to the north-west of the St. Lawrence River. There is an alignment of topographical lineaments in this direction in these two corridors, suggesting that they possibly represent scars of deep faults reactivated at a later time. The map also shows significant spatial relationships. Firstly, there are two important geochemical anomalies that coincide with these two corridors, as well as several mineral indicators (see the blue points on Figure 5). This spatial relationship supports the interpretation that there could be two major faults in a west-north-west direction allowing hydrothermal fluids migration. The presence nearby of a limestone lithology such as in the Sayabec Formation could represent possible reservoirs for hydrocarbons. It was highly recommended by MIR that further field samples be taken to verify the suggested interpretation of the fault system. Particular attention should be brought to bear on the search for hydrothermal dolomites located close to the north-west faults. Finally, MIR recommends the integration of the results of its analysis to the new seismic data acquired by the MRNF in the area, in order to confirm the presence of deep faults. Figure 5 : Important structural corridors in a west-north-west direction observed in the extension of the Saguenay graben.